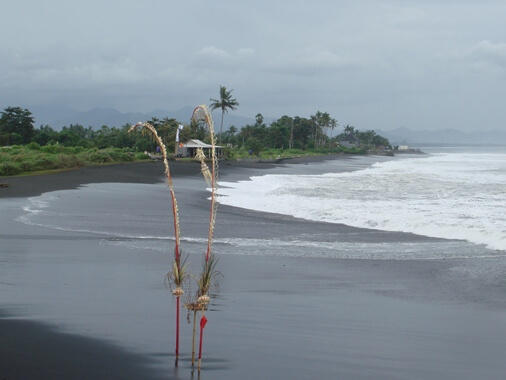 Keramas Beach offers a beautiful black sandy beach, rice fields and the stunning view of Indian Ocean. It has tranquil atmosphere and setting views with coconut trees and mountains. 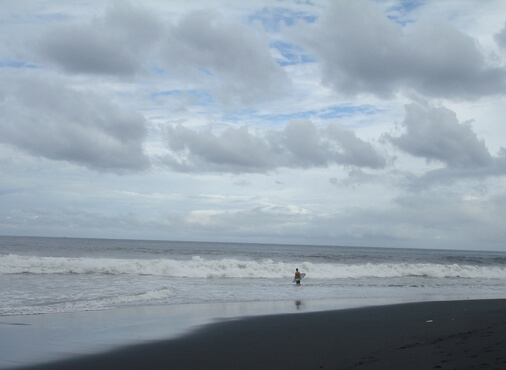 Keramas also offers great and fast wave that challenges the surfer to conquer and enjoy the surf adventures. Surfer can enjoy the night surfing sensation here. The beach club also provide seaside wedding with a backdrop of the most famous surf breaks in the world. Keramas Beach offers a beautiful black sandy beach, rice fields and the stunning view of Indian Ocean. This beach is a bit quieter than other beach in the South. Let's take a closer look for the Keramas Bali! Keramas Beach Bali is located in Keramas Village, the District of Blahbatuh, Gianyar Regency, Bali. This amazing beach is only 40 Kilometers from Denpasar City (about 21 minutes), and about 34 Kilometers from Ngurah Rai International Airport about 1 hour). Visitor can access this beach easy and fast through Bypass Ida Bagus Mantra. Keramas Bali is situated in Blahbatuh area and influenced by Somewhat Wet Region or C type climate (based on Schmidt-Ferguson climate classification maps). The C type climate here have a humid season start from November continues to June. Dry season runs from August to October. Keramas Bali also close to another tourist attraction such as Horse Riding in Saba Village and Bali Safari and Marine Park in Serongga Village. This exotic waterfront is a perfect location to relax and walking down along the coast. Keramas also provides an ideal location to stay while exploring the East Bali. Keramas also offers great and fast wave that challenges the surfer to conquer and enjoy the surf adventures in Bali's beautiful East Coast. 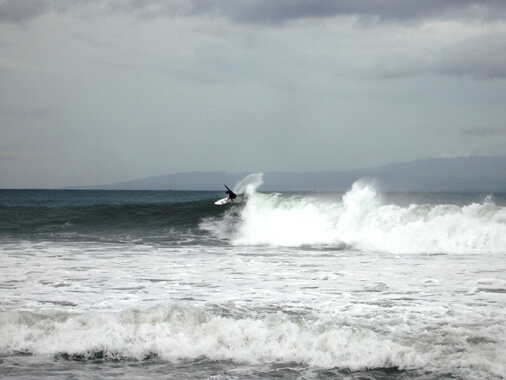 The Surf Break in Keramas Bali is renowned as the few perfect rights (right-hander) in a land of lefts. This world class waves are created by the wind flows from the southwest. This beach is uncrowded surfing spot and almost away from pollution and hectic situation. 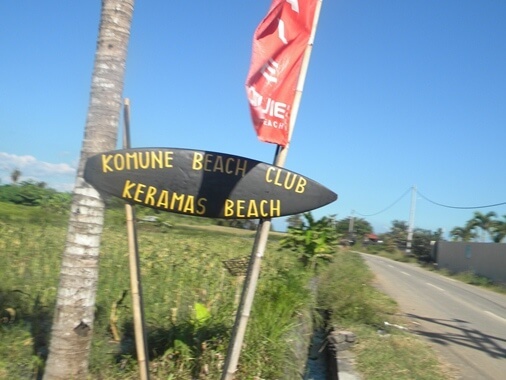 Keramas beach has been visited by surfers from both foreign countries and local. Regardless, surfer will need to be careful when considering paddling out in huge wave because the reef is shallow and sharp, the currents can be fierce and difficult to exit the water. 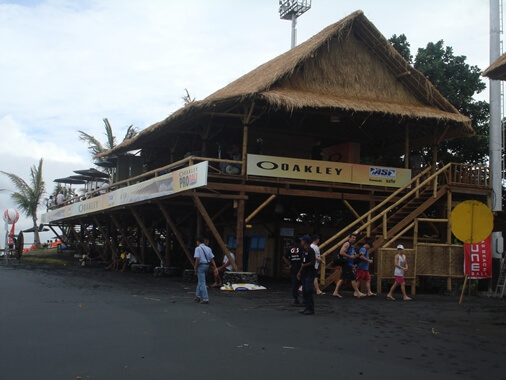 On June, 2013, Keramas Beach Bali was on the Association of Surfing Professionals (ASP)'s 2013 Men's World Championship Tour schedule as the Oakley Bali Pro. Surfers can enjoy the night surfing sensation at Keramas Beach. Night surfing here is supported with the installation of stadium floodlights and was able to illuminate up to a distance of 500 meters. Night surfing at Keramas beach is highly recommended for intermediate to advanced surfer. Surfer must really can feel the waves because it completely dark even with the support of floodlights. Surfers are invited for free warm-up session before the actual night surfing here. The session of 1 hour of night surfing is around 7pm - 10 pm and a maximum of 6 people will be allowed at one night surf session. Night surfing in Komune Keramas Beach dependent on tide, wave condition or lightning. But the night surfing will still go on despite of wet weather or rain. Surfers can bring their board or rent on site. Komune Keramas Bali is also a marvelous wedding place. Komune offers seaside wedding with a backdrop of the most famous surf breaks in the world. It has tranquil atmosphere and setting views with coconut trees and mountains. This beach is blessed by romantic nuance created by the sunset along the beautiful black sandy stretch. The natural pristine volcanic beach, the crushing surf break and also spectacular ocean view giving an enchanting feeling, more romantic, and a unique wedding day. Take your time to visit Keramas Bali, hopefully helpful and thank you! 1. Bali Safari and Marine Park. Pererenan Surf Bali - Great Waves and Peaceful Surrounding!